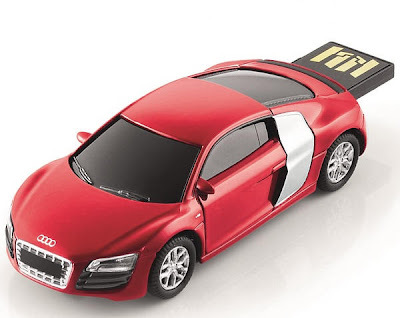 Audi merchandise has come up with yet another thing for auto enthusiats to add to their collections. The Audi R8 V10 USB memory stick is fun, sporty and designed to meet our customers’ need for being stylish. It’s a perfect mix of miniature car with USB. Audi R8 V10 memory stick will be available in the Indian market for INR 3,299 in the sporty red colour with a 4GB capacity. The appeal of this USB stick in the shape of Audi R8 V10 on the scale of 1:72 lies in its impressive design. Other exclusive merchandise available in India across all dealer networks include high-end Classic Chronograph watches, sophisticated messenger bags, sports bags, travel bags, backpack, and stylish garment bag.